Dummy Up! is the forty-ninth comic issue, released 26 May, 2010 in the US. After Leela has a bad date with Cthulhu, and Bender gets into a fight with him, she and Fry decide to spend the evening at the office. Planet Express appears to be under attack, but it's just the semi-annual surprise stress test. Leela's stress level is too high, so she is sent to a yoga studio. Bender returns, severely mangled, and after the repairs his sense of humour needs rebooting, so he plans to take Fry to the comedy club. The next day, Leela attempts yoga, but the instructor is Fnog, who is still highly sexist and infuriates her. At Bits & Giggles that night, Bender heckles the comedian and takes the stage, only to be booed off. Back at Planet Express, Zoidberg gives Leela a pill that an unethical pharmaceutical company promised will make a person one with the universe. Meanwhile, at their apartment, Bender reveals to Fry his ventriloquist dummy; Small Fry. Bender's new act is incredibly popular, but afterwards Small Fry tries to kill Fry, which Bender find hard to believe. Having taken the pill the night before, Leela is able to communicate with inanimate objects and animals, which quickly becomes tiresome. Bender is booked for The 2nite Show. He leaves the Frys in the green room so he can talk to Calculon, and returns later to see the room destroyed and on fire. On a delivery the next day, Leela crashes the ship into an asteroid while arguing with the control panel and her chair. 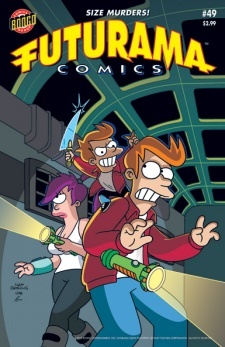 Fry is sent to dislodge the ship, and Small Fry attempts to kill him again. Back at the office, Bender reveals that he's been offered an hour long show, so he's created dummies of the Professor, Hermes, Leela and Zoidberg to help him out. Leela tells the Professor, Hermes and Zoidberg that the voices are making her crazy, so Hermes fires her. However, his jacket tells her a secret which she uses to blackmail him into letting her keep the job. The five dummies move to attack their counterparts, and it is revealed that Bender used the Professor's cloning tanks to make them, but altered their brains so that they'd hate humans. The Professor's clone has built a duplicate of Bender, and the two groups have a brief battle, with the originals winning. Farnsworth installs a mental voice-mail chip in Leela's head to allow her to ignore the voices she doesn't want to hear, and she promptly uses it to ignore Fry's advances. Bender doesn't get his TV series, which instead goes to his duplicate. Bender claims to have met Calculon 37 times before, including one occasion on which they saved Kwanzaa. Zoidberg states that blushing is incredibly painful to his species. This was the last comic to be released before the beginning of the second run. Fnog: Ah yes, Dr. Zoidberg! My greatest student! He came to me with his mind an empty cup waiting to be filled! Zoidberg: Can that cup be filled with clam chowder maybe? Professor: Yes, yes, you’re perfectly fine except for one small thing. Bender: Normally, I’d be telling a joke right now about what that small thing is. Fry: Ha! With these painkillers I’m on, everything’s funny to me! Even my incredible pain! Leela goes on a blind date with Cthulhu at the start of the issue. A pair of Autobots from the Transformers franchise appear. Conan O'Brien's head is bumped from hosting The 2nite Show in favour of Calculon. Bender calls Cthulhu "Squidward," a reference to the character from the animated TV show SpongeBob SquarePants. This issue was promoted as having been drawn by John Delaney, however Mike Kazaleh was responsible. Zoidberg's clone has teeth, these were retconed out in early seasons of the show. Leela's clone's wristlojackimator is coloured white in one frame. Leela crosses a New New York street on foot. The cars driving past, and the taxi that almost hits her, all have wheels. This page was last edited on 26 May 2014, at 21:57.